Author(s) Scarre, Chris; Fagan, Brian M.
Ancient Civilizations offers a comprehensive and straightforward account of the worldâs first civilizations and how they were discovered, drawing on many avenues of inquiry including archaeological excavations, surveys, laboratory work, highly specialized scientific investigations, and both historical and ethnohistorical records. This book covers the earliest civilizations and the great powers in the Near East, moving on to the first Aegean civilizations, the Mediterranean world in the first millennium, Imperial Rome, northeast Africa, the divine kings in southeast Asia, and empires in East Asia, as well as early states in the Americas and Andean civilization. 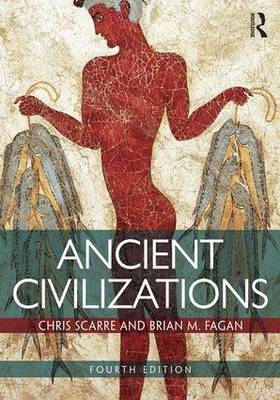 Ancient Civilizations includes a number of features to support student learning: a wealth of images, including several new illustrations; feature boxes which expand on key sites, finds and written sources; and an extensive guide to further reading.ãã With new perceptions of the origin and collapse of states, including a review of the issue of sustainability, this fourth edition has been extensively updated in the light of spectacular new discoveries and the latest theoretical advances. Examining the worldâs pre-industrial civilizations from a multidisciplinary perspective and offering a comparative analysis of the field which explores the connections between all civilizations around the world, Scarre and Fagan, both established authorities on world prehistory, provide a valuable introduction to pre-industrial civilizations in all their brilliant diversity.